serves nearly 650 students from Junior Kindergarten to Grade 8. Harry J. Clarke offers a French Immersion Program for students in Grades 4 to 8. Harry J. Clarke PS is a Healthy Active School Community. 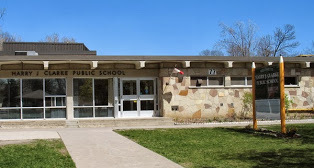 The school is proud of its library with bilingual resources, and has a computer lab, well-equipped gym and a music room. Students have access to programs such as instrumental music, band, choir, clubs, team sports, intramural programs, and a student leadership team. Community and parent involvement is high at this busy and active school. Students proceed to Eastside Secondary School for Grades 9 to 12 and our French Immersion students can select to continue their enriched French program at Bayside Secondary School. Harry J. Clarke Pubic School is a nut sensitive school. Please do not send peanut or other nut items with your child to school. Please see the April Newsletter. Please see the April Calendar of Events for HJC. HJC is running a Little Caesars and Vesey Bulbs fundraiser to help support the school's Breakfast Club program and the purchase of new chromebooks for the school. Orders are due to the office by March 26. You can order your Little Caesars online at http://www.pizzakit.ca/fundraising-products?shop=1&f=366067&s=290131. Use our fundraising code 366067. Please see the attached links for the March Newsletter and Calendar.